and place your order through our global Spherical Magic secure cart. just contact us. We'll do our very best to make your wish come true. A beautiful 26 foot canvas mural depicting the wonders of the Universe where the different classes of meteorites found on Earth began their journey. as you begin another "day" in space. Very popular in the Astronaut Office, this image has become a tribute to the program ended all too soon. A mile closer to space. 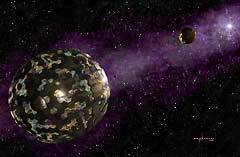 A Dyson Sphere made from solar system parts begins to take shape around the parent star. The most famous golf shot of all time captured in great detail in paint on canvas from the position of the low resolution TV camera; the only record of this momentous event. Over a year of research went into the creation of this painting. Public Enemy's Fear of a Black Planet CD Cover. Voted one of the 50 Greatest Album Covers! That which has gone before and that which shall come after, reflected for a fleeting moment in an Astronaut's visor at the close of the final EVA. You are a Mission Specialist taking part in the care and feeding of the Hubble Space Telescope. Desert Planet. Home of the Fremen. To fly is to live. All else is merely waiting. 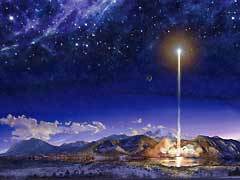 2004: The STARDUST™ spacecraft prepares to enter the coma of Comet Wild-2 and return samples to Earth. Now at closest approach to the nucleus, the spacecraft is pummeled by particles as it speeds past at 13,000 miles per hour. Mission Success! Severely pummeled but triumphantly intact, the spacecraft has now passed out of danger. Its Whipple Shields bearing the scars of battle can be easily seen as the spacecraft sails on toward home. All three Mission Panormas on one sheet. Craig Wilson, a sculptor friend of mine, creates in welded steel the most wonderful predatory birds. If René Magritte had been born in America? This work was executed in neutral grey pigments in order to explore the realm of painting in value alone, exclusive of color, to obtain the rich depth of that found in black and white photography. A water planet orbiting a distant star, its family of moons, and evidence in the distance of something large once passing this way. A glorious view from the observation lounge looking down upon Imperial Earth's favored tourist attraction. An homage to the film of a similar name; drawing perspective on our place in the Universe. The Cover of James A. Michener's Novel. Commemorating the flight of the first Space Can, a micro-gravity carbonated beverage dispenser developed for NASA by the Coca-Cola Corporation. Perhaps one day this will become a common occurrence. A very dear friend's trimaran, it's aft cabin lights aglow, close hauled on the solar wind of Zeta Orionis on their way to the Horsehead Nebula. back in time for dinner. sixteen of them a day. From a description by United States Astronaut (Ret.) Joseph P. Allen. Credit Cards, On-line Checks, Checks or Money Orders are accepted through 128-bit encrypted SSL connection to our global Spherical Magic secure server to protect your personal data. You may also call toll-free: 1-8-SPHERICAL (1-877-437-4225) to place your order.